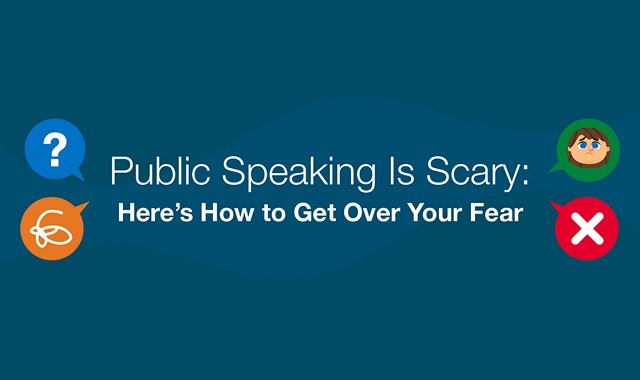 Public Speaking is Scary: Here's how to get over your fear #infographic ~ Visualistan '+g+"
More than 40 percent of Americans admit to a fear of public speaking. In fact, public speaking is the country’s top phobia. Dubbed glossophobia, it’s ranked scarier than spiders, darkness, heights, and even death. Symptoms can include intense anxiety, nausea, shaking, a quavering voice, and panic attacks. Even when it doesn’t reach the levels of outright phobia, public speaking still provokes nerves—up to 75 percent of people experience speech anxiety. This fear may have biological roots. One theory posits that our “lizard brains” can’t tell the difference between a real threat and an imagined one, so we react to standing in front of a group of people the same way we may respond to being stalked by a mountain lion: with fear. Another possible explanation is that glossophobia stems from the fear of being judged or rejected by our peers.